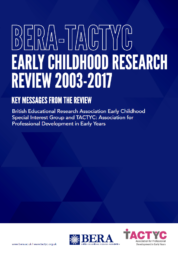 We are pleased to announce the launch of the BERA/TACTYC Review of Early Childhood Education and Care in the UK, 2003-2017. This review has involved a wide range of early childhood specialists, both in the early consultation stages, and in writing the five main sections of the Review. Teams of authors and their reference groups came together from TACTYC – the Association for Professional Development in Early Years, and the BERA Early Childhood Education and Care SIG. Using specific questions to interrogate the literature, each team worked on one of five main themes: Professionalism; Parenting and Family; Play and Pedagogy; Learning, Development and Curriculum, and Assessment and School Readiness. These themes are contextualised within broad policy issues in the UK. The Introduction shows the working methods for the Review, and the Conclusion brings together key messages and suggestions for future research. We hope that the Review will prove useful to a range of early childhood specialists, including students, researchers, practitioners, policy makers and teachers in further and higher education. We intend to create a User Review that will be aimed at practitioners and to engage other stakeholders in current trends and debates. The Review is being launched at a time of change and uncertainty within early childhood education and care, and we hope that the Review will provide a focal point for discussions about future directions in the four UK policy frameworks, the importance of research, and how we use research evidence to inform provision and practice.